Cupertino's got a lot of problems to fix. The headlines spoke of Armageddon, but the stock spoke of a potential phoenix rising out of the ashes. Sure, financials were down from a year ago. The guidance doesn’t speak of an immediate turnaround, but we are talking about a company with $245 billion in cash. In addition, Tim Cook & Co. are sitting on a potential gold mine if they mine it correctly. Apple (AAPL) saw its service revenue increase from 19% to $10.9 billion. Tim Cook stated, “we’re not taking our foot off the gas.” I’m not even sure what that means, but it sounds ominous, although I’m not sure if rivals are quaking in their collective boots. The company focuses on paid services, which brings me back to thinking that management should make acquisitions rather than depended entirely on organic growth. The stock breaks out with a close above $160. From there, it has the potential to $187. Although I’m not a big fan of economic guidance or predictions from the Congressional Budget Office (CBO) or the International Monetary Fund (IMF), or the World Bank for that matter, the report on the current path of government is alarming and probably understated. For this year, the CBO expects a $900 billion deficit, which would be 4.2% of the Gross Domestic Product (GDP). 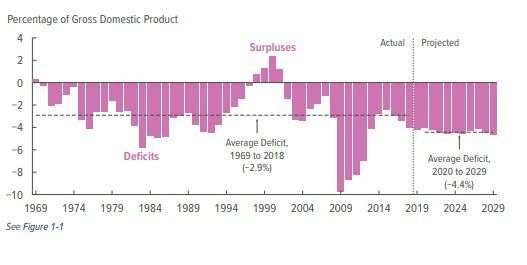 The CBO projects a 2019 deficit of about $900 billion, or a 4.2% of the GDP product. The annual change would see a deficit at 4.7% of the GDP in 2029. Let’s be honest. There is no way either party is going to do the right thing. And at this point, we can only hope there aren’t any schemes put into place, such as spending trillions of dollars on health insurance “rights” that would destroy millions of jobs and won’t deliver improved health outcomes. Yesterday was about safety in oversold blue-chip sectors (Industrials and Materials), some of which made remarkable moves, including Whirlpool (WHR), Corning (GLW), and Xerox (XRX), while investors sold momentum names ahead of Apple’s earnings. The market was elevated all morning, but it took off after Boeing (BA) posted an incredible earnings report with major milestones and strong guidance. Company surpasses $100.0 billion in annual revenue for first time ever with a monster fourth quarter. After Paccar (PCAR) posted monster results yesterday, Oshkosh has also delivered. I think we must consider being even more overweight in industrials considering the guidance coming from the sector. The ADP jobs report was posted this morning and crushed Wall Street consensus. We’ll have details in the afternoon note. I will say, equity futures slipped a little on the news as the Fed finishes their FOMC gathering and Jay Powell takes to the microphone. He will be asked about no rate hikes despite a robust jobs market. It is mind numbing to watch our Federal Government and elected officials continue to operate and act in such irresponsible ways. Why do the American people tolerate this? They would not stay with a bank or financial institution that behaves in such reckless behavior. HOW do we get enough voters to actively speak up and demand a change in course and behavior. Our Congress has demonstrated malfeasance in their fiduciary responsibilities and should be held accountable!